Along with snow shoveling, mowing lawns is one of the least exciting aspects of yard maintenance. Still, it has to be done, so follow these tips to ensure that you are cutting grass properly and caring for it correctly. You may have wondered about some of these issues (especially if you are a newbie); the answers to some of these questions are hardly obvious, even to people who have been tending lawns all of their lives. Aesthetics Aside, Is It All Right to Wait Longer in Between Mowing, So I Can Save Myself Some Work? Is There a Right and a Wrong Way of Mowing the Lawn? Do I Have to Rake Up or Bag the Grass Clippings, or Can I Leave Them? How High Should the Grass Be Cut? I'm Putting in a New Lawn. What Are the Pros and Cons of Laying Sod vs. Sowing Grass Seed? What Type of Grass Should I Grow? How Long Does Grass Seed Remain Viable? I Remove as Much Thatch as I Can in Fall While Raking. But What Can I Do in Spring to Fight Thatch Build-Up? When Is It Safe to Apply Grub Killer to a Newly-Seeded Lawn? When Should I Worry About Grass Pollen Allergy in the North? How Do You Level Out an Uneven Lawn So That It's Easier to Mow? How Can I Tune Up My Mower? Do I Need to Clean the Deck of My Mower? Should I Add Oil Each Time I Use My Mower? How Do Self-Propelled Mowers Work? What’s the Difference Between Riding Mowers and Lawn Tractors? Is There a Right Time and Wrong Time to Mow the Lawn? Yes. You should not mow the lawn when the grass is wet (under which conditions disease can be introduced, plus you incur the risk of slipping and getting injured), for example. So the period just after a rainstorm would be a wrong time to mow, as would a time (early morning) when the grass is still covered with dew. During the late morning (after the dew has evaporated) of a dry day, however, is an example of a right time to mow the lawn. But deciding on when to cut the grass goes beyond waiting for dry conditions. Other factors go into picking a right time to mow the lawn, including personal factors. What if you're not a morning person, for instance? That's certainly a consideration. There are also further objective factors that we have yet to take into account. For example, mowing when the sun is pounding down on your grass, as it would during the afternoon of a hot summer's day, puts a lot of stress on the lawn. Cutting grass in the evening, instead, would put less stress on it. On the other hand, you don't want to cut the grass too late in the day, after darkness starts to fall, as this is a period of reduced visibility (which increases the chances for a mowing mishap). As you can see, a lot of "juggling" will likely enter into your decision-making process. All else being equal, the early evening of a dry day may be the right time for mowing lawns if you're the type of person who really doesn't stir about very much until well after the day is half over (and yes, it takes one to know one). In conclusion, deciding on when to mow the lawn entails balancing personal factors with the cold, hard facts regarding safety and what's best for the health of your grass. Now that you have answers to some of the most common questions regarding how to cut grass properly, let's pose -- and answer -- some other questions that may be troubling you. You should sharpen the blade every month or two. The reason for sharpening mower blades is that dull blades have a tendency to rip grass blades instead of cutting cleanly, leaving grass susceptible to diseases. Remember, fungi are opportunists and will exploit open cuts, especially under moist conditions. Such moist conditions are very much present when you're mowing, since cutting grass blades releases some of the moisture content within them. First remove the spark plug wire to ensure the machine doesn't start up accidentally, resulting in injury. Safety is always your first concern; brush up on your yard safety knowledge here. With a wrench, remove the nut that holds the lawn mower blade up against the deck, then remove the blade. If you own a vise, stabilize the blade by securing it in your vise. Use a file to do the sharpening. Follow the angle of the cutting edge that's already there (the angle will be roughly 45 degrees). It's important to pass the file the same number of times on each side, to keep the blade in balance. If your blade is bent or nicked, sharpening won't be adequate -- you need to replace it with a new one. Consult your owner's manual to ensure that you purchase a suitable replacement. How Do I Clean or Replace My Mower's Air Filter? Before changing or cleaning the air filter, first determine whether your lawn mower has a paper or foam air filter. Paper air filters are replaced, while the foam ones (which are less common than they used to be) are cleaned. Soak the new piece of foam with clean engine oil. Squeeze out the excess oil using a clean rag. Insert new foam in air filter. Ensure the lip protrudes over edge of the unit. Besides Cleaning the Spark Plug, What Other Mower Care Do You Advise in Spring? Check that all nuts and bolts are secure every spring, tightening them where necessary. Re-check them for tightness periodically thereafter. Lawn mower vibration loosens nuts and bolts more than you might think. Are There Any Shade-Tolerant Grasses? 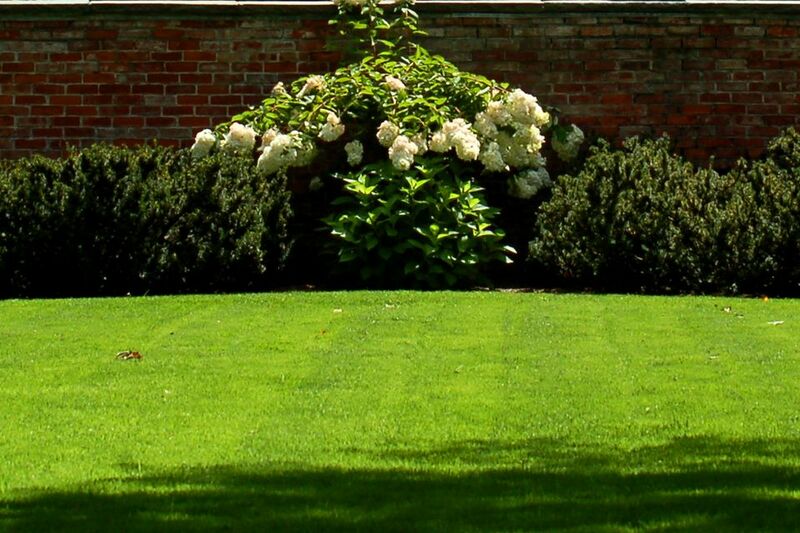 Many lawns are plagued with shady areas, which are generally inhospitable to grass. For instance, if you have large shade trees in the lawn, you may have trouble getting grass to grow under them. Many who find themselves trying to get rid of moss in the lawn can thank shade, in part, for their problem. For the South, St. Augustine is used. For Northern lawns, tall fescues are often the best solution in shady areas. When Is the Best Time to Fertilize Warm-Season Grasses? Among the common warm-season grasses are Bermudagrass, buffalograss, zoysiagrass, Bahiagrass, centipedegrass and St. Augustinegrass. The best time to fertilize these warm-season grasses coincides with the time when they grow most vigorously. The time when you should fertilize warm-season grasses is late spring, because that's the time when they begin to grow most actively. Fertilizing again in summer and early autumn will keep them vigorous. Some also recommend fertilizing earlier in spring to give them a boost. However, avoid fertilizing warm-season grasses late in autumn. That’s when they are winding down their growing season, and fostering new growth would only make them more susceptible to winter injury. When Should I Fertilize Cool-Season Grasses? You probably know that Kentucky bluegrass is one of the cool-season grasses. What are some other types? Well, fescue is frequently part of grass-seed mixes for lawns in the North. There are both tall and fine fescues; don't confuse either with blue fescue, which is an ornamental grass. Bentgrass and ryegrass are also cool-season grasses. But the question is, What is the best time to fertilize these? Hint: it coincides with the time when they grow most vigorously. Fertilize cool-season grasses in spring and autumn -- the seasons when they grow most actively. But avoid fertilizing too heavily late in the spring, since heavy fertilization at that time can lead to disease problems. What if I Do Not Want to Have to Cut Grass? Are There Alternatives? "When I bought my home the dominant landscaping element on the property was lawn. I have been faithfully cutting this expanse of grass for years, but now I am tired of mowing the lawn. Do I have any alternative?" Your case is not unusual. Many people who buy their first home inherit a huge plot of grass with it. They faithfully mow this expanse of lawn for years, without considering alternatives to lawns. But, yes, there are alternatives. Depending on where you live, it may be acceptable again to have something on the grounds in front of your house other than grass without your being looked upon as some kind of a weirdo. Ground covers, wide walkways and flower beds are seen increasingly in front of respectable homes as front-yard landscaping alternatives to the traditional lawn. Even vegetable garden beds are becoming acceptable if designed so as to be attractive. To that end, a growing body of literature is arising detailing how you can have an "edible front yard" without having the neighbors conclude that you are a total degenerate. The native plant movement: growing only plants native to the area in question. An important aspect of xeriscaping is selecting drought-resistant plants over those that require more water. For more on xeriscaping as an alternative to lawns, please consult the full article on xeriscaping plants. What's the Best Lawn Mower for the Environment? If you consider yourself an environmentalist, you're obligated to consider the alternative offered by reel lawn mowers. In terms of fighting air pollution, reel mowers and electric mowers are both excellent environmental selections. To reduce the environmental burden on community landfills, make sure that, whatever type of mower you select in your shopping, it has mulching capabilities. Alternatively, put the grass clippings in a compost bin. Consult my tips if you need to learn how to make compost. Cordless Electric Mowers Are "Green," but What Else Do They Offer? One other benefit is that there's a feeling of freedom that comes with using cordless electric mowers. Dragging around the cords of corded electric mowers is a nuisance. It’s also potentially hazardous, with the potential of accidentally running over the cord with the mower. Fortunately, "electric" is no longer synonymous with cumbersome cords. The new cordless mowers are safer and more flexible. An added benefit is that they start with a switch, not a pull-cord, facilitating start-up. Cordless mowers run on rechargeable batteries, as explained in this review. So how do they compare with other models using noise as a criterion? Not as quiet as reel mowers, cordless mowers are still less noisy than gas-powered mowers. Cordless models work best if your lawn is 1/3 of an acre or less. It's also a good idea to mow the grass regularly when relying on these machines. They’re not effective for larger lawns or for tall grass, since either condition puts a lot of strain on the battery. And pushing them up hills can put a lot of strain on the operator, so make sure you purchase a self-propelled model. Cutting moist grass also strains battery-powered mowers, although, technically, you shouldn’t be mowing at all if your lawn isn’t dry. What Types of Rotary Mowers Are There and How Much Do They Cost? Gas-powered rotary lawn mowers can be divided into two categories: walk-behind rotary mowers and riding mowers / lawn tractors. The walk-behind rotary lawn mowers can further be classified according to whether they’re push-type lawn mowers or self-propelled. Purchase price varies greatly between these types of rotary lawn mowers, with riding mowers / lawn tractors being the most expensive, followed by self-propelled mowers. The push-type mowers are the least expensive because they require you to provide the muscle to make them move.